OVERLAND PARK, Kan., March 14, 2019 /PRNewswire/ -- Sprint (NYSE: S) is celebrating the opening of its Sprint 5G Experience, a dedicated immersive center designed to showcase and explain how 5G works and to help change the way people live, work and play. 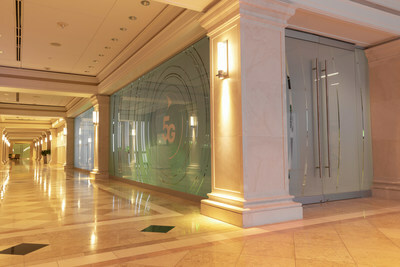 The company held a ribbon-cutting ceremony at its headquarters to unveil the space ahead of its 5G commercial service launch expected to begin in Kansas City and other markets in May. The Sprint 5G Experience provides more than a dozen interactive demonstrations that showcase the capabilities of 5G. Dr. John Saw, Sprint chief technology officer cuts the ribbon at Sprint 5G Experience located in Overland Park, Kan. Guests take part in a virtual reality 5G demonstration at the Sprint 5G Experience. "We are thrilled to provide our guests and employees an exciting way to experience the future of wireless technology in a fun and educational way in our new space," said Steve Gaffney, Sprint vice president of media and experiential marketing. "With Sprint 5G coming soon in our first nine markets, this dedicated venue will provide unique and interactive ways to tell the story of 5G and help visitors visualize the types of innovations it will bring." The Sprint 5G Experience features more than a dozen stations and demonstrations that use augmented reality, virtual reality and simulated displays. The journey takes visitors through the foundation for 5G from spectrum to a fiber-optics network and from Massive MIMO technology to real-world demonstrations of 5G's lower latency. Guests will learn how 5G will help innovate gaming and entertainment, power smart cities and make cities safer, and connect billions of things through IoT. The 1,100 square foot space is located in Sprint's Executive Briefing Center in Overland Park. "With faster speeds and lower latency, 5G has the potential to significantly improve our homes, workplaces, cities and lives," said Dr. John Saw, Sprint chief technology officer. "As we prepare to launch Sprint 5G with so many companies in our ecosystem, we are proud to be working with them to showcase what is possible with our next-generation technology in our new 5G Experience." Sprint expects to launch its commercial 5G service starting in May. Atlanta, Chicago, Dallas and Kansas City are among the first of its nine 5G markets. Also slated to launch in the first half of 2019 are Houston, Los Angeles, New York City, Phoenix and Washington D.C. Its total initial 5G footprint is expected to cover more than 1,000 square miles across all nine cities giving true mobility to on-the-go customers. Sprint's 5G Experience will provide private tours to small and medium business, enterprise and government customers and prospects, along with the greater Kansas City economic development community interested in better understanding the benefits of 5G. Learn more about booking appointments at: https://business.sprint.com/sprint-5g-experience/. Sprint will also use the new venue to provide its employees with live and virtual tours to learn more about what 5G will bring. Sprint recognized Ericsson, Intel, LG, Nokia, Qualcomm Technologies, Inc., a subsidiary of Qualcomm Incorporated, and Samsung Electronics for their support in bringing the 5G Experience to life. "Ericsson is excited to be an integral part of the Sprint 5G Experience," said Mikael Stromquist, Executive Vice President and Head of Customer Unit Sprint for Ericsson. "Ericsson working together with Sprint will bring the exciting benefits of 5G and IoT to customers. 5G and IoT are going to change the lives of consumers and businesses, and the Sprint 5G Experience is an amazing place to see what's possible." "LG cannot wait to bring the best-in-class LG V50 ThinQ 5G to consumers across the country this summer," said William Cho, president and CEO of LG North America. "Sprint's 5G Experience serves as an interactive and informative way to show what's possible and we're proud to showcase LG's advancements in 5G, building off our legacy in leading 4G LTE." "We are excited to be a part of Sprint's new immersive environment to offer a glimpse of Sprint's vision of 5G. Nokia is showcasing its end-to-end 5G approach and technology innovations through massive MIMO, lower latency and mobile edge computing with its software demos. These are designed to show visitors how business, industry and human experiences can be transformed through Sprint's 5G network," said Ricky Corker, President of Customer Operations for the Americas, Nokia. "2019 is the year of 5G. We are thrilled of our work with Sprint and other mobile industry players to make 5G a reality in America," said Joe Glynn, Vice President, Business Development, Qualcomm Technologies, Inc. "The opening of Sprint's 5G Experience showcases the incredible capabilities of 5G and helps to crystalize the mobile industry's vision for how 5G will transform industries and the mobile experience. We will continue to collaborate with Sprint in the rollout of its 5G commercial service supported by flagship smartphones launching over the next few months based on our 5G technology." "We are pleased to be part of the Sprint 5G Experience to showcase the many ways in which 5G networks will impact consumers and businesses," said Lyle Nyffeler, Vice President, Networks Division, Samsung Electronics America. "With Sprint testing and optimizing its deployment of Samsung 5G solutions using massive MIMO radios that are on air in Chicago, the pace of 5G availability is accelerating. We look forward to continuing to collaborate with Sprint to demonstrate the many innovations enhanced by 5G."